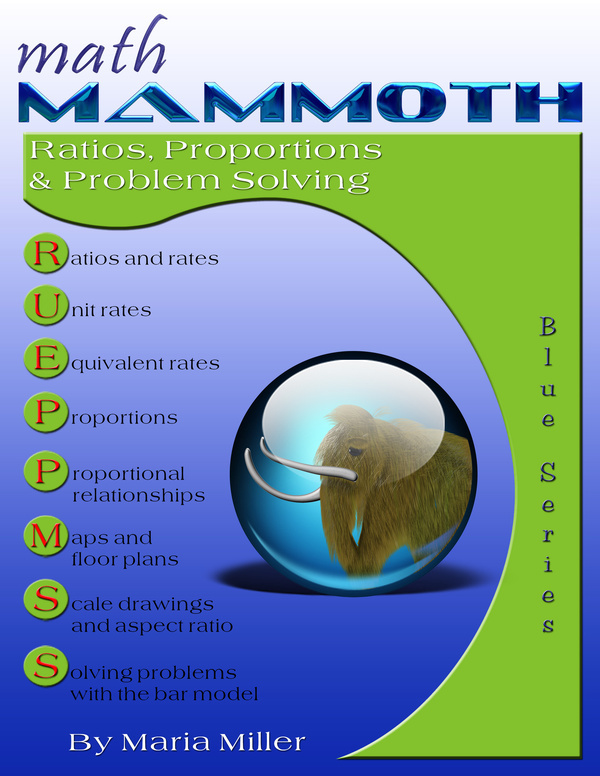 Math Mammoth Ratios, Proportions & Problem Solving - a printable worktext for grades 6-7. 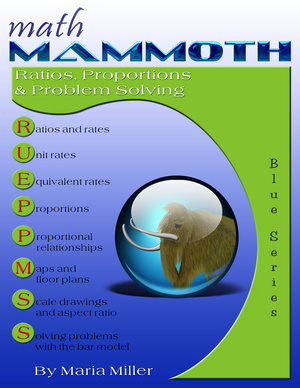 Math Mammoth Ratios, Proportions & Problem Solving is a worktext that concentrates, first of all, on two important concepts: ratios and proportions, and then on problem solving. The book is best suited for grade levels 6 and 7. The book starts out with the basic concepts of ratio, rate, and unit rate. The lessons on unit rates not only show how to calculate them and gives practice at doing so, but also include practice with unit rates that involve complex fractions. The two lessons on equivalent rates allow students to solve a variety of word problems involving ratios and rates. We also connect the concept of rates (specifically, tables of equivalent rates) with ordered pairs, use equations (such as y = 3x) to describe these tables, and plot the ordered pairs in the coordinate plane. Then, students encounter the concept of aspect ratio, which is simply the ratio of a rectangle's width to its height, and solve a variety of problems involving aspect ratio. Next, students learn how rates can be used to convert measurement units. This method is in addition to the methods for converting measurement units that are explained in Math Mammoth books on decimals. It does not mean that students should "change over" and forget what they have learned earlier — it is simply a different method for doing the conversions. Some students may choose one method over another; some may be able to master all of the methods. Most will probably choose one method they prefer for doing these conversions. After this, we turn our attention to proportions (which is an equation of two ratios). The lessons show how to solve proportions using cross-multiplying and how to set up proportions the correct way. We also study briefly what cross-multiplying is based on (it is not a magic trick!). The concept of direct variation is introduced in the lesson Proportional Relationships. Writing and graphing equations gives a visual understanding of proportionality. In two following lessons on proportions, students also practice solving rate problems in different ways, using the various methods that they have learned throughout the book. The lessons Scaling Figures, Floor Plans, and Maps give useful applications and more practice to master the concepts of proportions. There is also an optional lesson, Significant Digits, that deals with the concept of the accuracy of a measurement and how it limits the accuracy of the solution. Lastly, we study various kinds of word problems involving ratios and use a bar model to solve these problems. These lessons tie ratios in with the student's previous knowledge of bar models as a tool for problem solving.